Some of our dogs are local, national, and even international celebrities on air and in print! This page is for showing off their accomplishments. These are dogs that we own, dogs that we have bred, or dogs from outside breedings with our stud dogs. 6 Pack was featured on the Kenosha News on April 21, 2013. 6 Pack is from the Schroderhaus German Shepherds 2012 "A" Litter sired by UKC CH, SG Berlin an Granville vom Gildaf STAR, CGC, HIC, TC, AD, FDCH, TF-III, TN-N, CA, TD out of Josephina von der Schroederhaus CGC, TD. Click here to read the news article. 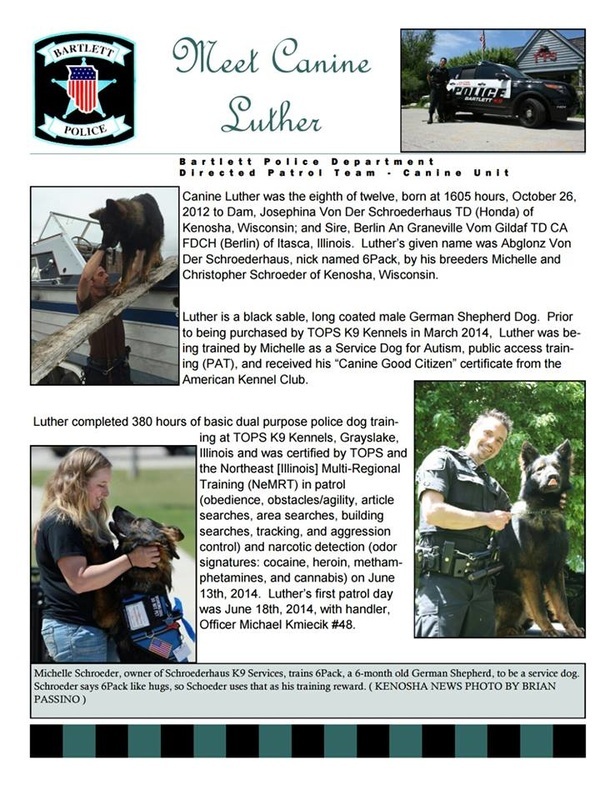 In May 2014, 6 Pack was renamed Luther and joined the Bartlett, IL police department in June 2014. Click here to read the news article. Aja was the cover dog for the UKC Bloodlines magazine publication in May 2013. Aja is from the Granville German Shepherds 2009 "A" Litter sired by SG Jabina Bertram BHP2, KKL2 out of (AKC CH Pointed) UKC CH, SG She Izabella Granville CGC, TDI, HCT, AD, BH, CD, RA, OA, OAJ, NF, OAC, TG-N, TN-N.
Magnum's family was asked to present their service dog story to the Barnesville Rotary Club in February 2013. Magnum is from the Schroederhaus German Shepherds 2012 "A" Litter sired by UKC CH, SG Berlin an Granville vom Gildaf STAR, CGC, HIC, TC, AD, FDCH, TF-III, TN-N, CA, TD out of Josephina von der Schroederhaus CGC, TD. Berlin starred in a commercial for Chicago's Channel WCIU in February 2012. Berlin is from the vom Gildaf 2008 "B" Litter sired by V Puck vom Gräfental SchH3,KKL1 out of UKC CH, G Brazen vom haus Behm CGC, BH, CD, AD, FMX. 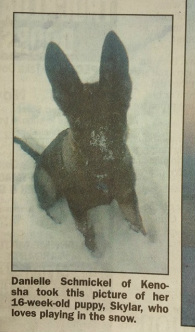 Sklyar's photo was featured in the Kenosha News on February 16, 2014. Skylar is from the Schroederhaus German Shepherds 2013 "B" Litter sired by UKC CH, SG Berlin an Granville vom Gildaf STAR, CGC, HIC, TC, AD, FDCH, TF-III, TN-N, CA, TD out of Josephina von der Schroederhaus CGC, TD. Jäger had his first criminal apprehension in August 2014 after only 6 months on the job. He's had several prior surrenders and drug finds since starting as well. Click here to read the news article. Jäger is from the Granville German Shepherds 2012 "C" Litter. Tsunami was featured on NBC's the Today Show on January 30, 2013 representing the German Shepherd Dog as one of the top 5 dog breeds for the American Kennel Club (AKC). Her photos were also taken and used in AKC Family Dog Magazine March/April 2013, the GSDCA German Shepherd Dog Review Magazine March 2013, and in the Chicago Tribune July 2014. Tsunami was also on Animal Planet's Series "Life at Vet U" in 2016. She has been featured in several news stories as part of the Penn Vet Working Dog Center's Ovarian Cancer detection research team. Tsunami is from the Granville German Shepherds 2012 "C" Litter sired by UKC CH, SG Berlin an Granville vom Gildaf STAR, CGC, HIC, TC, AD, TF-III, FDCH, TN-N, CA, TD out of UKC CH Arthur's Magical Molly von Granville STAR. Eli's photo was featured as a cover photo on the Leerburg Facebook Page and in their short Mondio Ring Nationals 2013 video in May 2013. Eli is from the Wir Vertrauen 2013 "E" Litter sired by UKC CH, SG Berlin an Granville vom Gildaf STAR, CGC, HIC, TC, AD, FDCH, TF-III, TN-N, CA out of Anna wir Vertrauen CGC, TDI. ​Nero trained with the Penn Vet Working Dog Center. Izzy appeared in a local Japanese publication in 2010. Izzy is from a 2006 litter sired by McGinnis' Buster out of Annei Mae McG.